We’ve all been there – driving down a highway behind a big truck and all of a sudden WHACK!, a rock bounces off your windshield leaving a nice crack in its place. 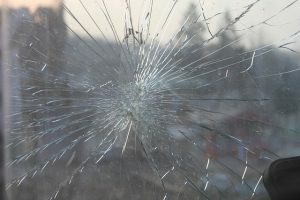 Most windshield chips and cracks, if repaired quickly, will allow you to keep your windshield for many more road trips to come, but how do you know when it’s time to bite the bullet and replace your windshield? Whether or not you need to replace your windshield is based on four factors: size, depth, location and safety. Read on for Freeway’s guide to whether you should repair or replace your windshield. The majority of repair shops can fix chips up to the size of a quarter, and cracks up to three inches long. Depending on technology and the shop’s capabilities, these sizes may increase or decrease so be sure to ask! Think of your windshield like a sandwich. You have two transparent pieces of glass on the outside, and a vinyl resin layer in the middle. This inside layer is what keeps the glass in place during impact in a collision. If you have a chip or crack that penetrates too deeply into this glass sandwich, it will need to be replaced. The location of your chip or crack will determine whether or not your windshield can be repaired. If the damage is in your line of vision or in the view of rain sensors, lane departure sensors, etc. you’ll most likely have to get your windshield replaced. This is because the repair will leave a slight distortion that can throw off sensors and make it hard for you to see the road clearly. Secondly, if the damage extends to the outer edge of the glass, replacement is probably your only option. Damage that extends this far usually means that the integrity of the windshield has been compromised, making replacement a must. Driving with a damaged windshield can pose a serious safety risk to you and your passengers. Windshields provide up to 45% of the structural integrity of the cabin of the vehicle, according to the Auto Glass Safety Council. If an auto body shop recommends that you need a new windshield because your current one isn’t keeping you safe, listen to them! If your car is in need of a new windshield – don’t delay. Contact the team at Freeway Auto Body to get a free windshield replacement estimate.